It's March 1st already. With the way this year is flying by, we'll be making Christmas lists before we know what's going on. But before that, let's end this Winter with a bang and welcome the oncoming Spring, enjoying the present. To rev up for the warmer months, we thought it a good plan to offer a more Spring-time friendly dish to get you excited. Position rack in bottom third of oven and preheat to 400°F. Sprinkle cornmeal on baking sheet. Unroll dough onto sheet, forming 10x15-inch rectangle. Mix salsa, oil, and chili powder in small bowl. Toss cheese and cilantro in medium bowl. Spoon salsa mixture over dough, leaving 1/2-inch border. Sprinkle with cheese mixture. 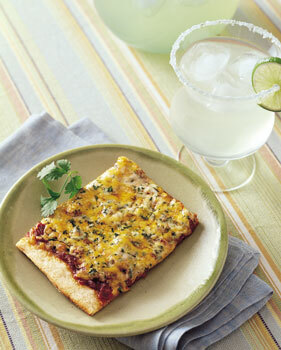 Bake pizza until crust is golden brown and cheese is melted and bubbling, about 15 minutes. Cut into squares and serve.